Birthdays are a big deal, but making a cake doesn’t have to be. Here is a simple way to turn an ordinary boxed cake mix into a very special birthday cake adorned with that special person’s age adorning the top. Choose the birthday boy or girl’s favorite flavor of cake mix, bake and decorate it with just a extra supplies. Prepacked frosting, a number cut from paper, and 2 different kinds of sprinkles is all you will need to make a boxed cake go from ordinary to extra special. This sweet little cake is fit for a princess at any age and is as easy to make and decorate as mixing up a prepacked cake mix, baking it and frosting it with prepackaged frosting. This is such a fun way to totally tailor any cake for any occasion without spending hours making it! Change up the colors, sprinkles, and flavor to suit absolutely any occasion that is worth celebrating! When our little princess turned four we had a little family party to celebrate. Her and her big brother shared a party and this was the “princess” cake that I made for her. Her big brother requested an Angry Bird dirt cake, but I wanted her to have her very own cake so she could blow out her candles and share it with her favorite people. I simply baked up a good old prepackaged confetti cake (which is her favorite flavor) in two round cake pans. I cooled them and added a layer of frosting before stacking the two cakes one on top the other. I also cut the top a bit so that it was nice and smooth for decorating. I used a prepackaged frosting to save some time and whipped it in my Kitchen Aid mixer (like I explained in an earlier post) to make it go a little farther. I did my best making the frosting nice an smooth and was ready to turn my ordinary pink cake into a numbered princess style masterpiece. First I printed out a 4 from my computer in a size that would fit on my round cake. 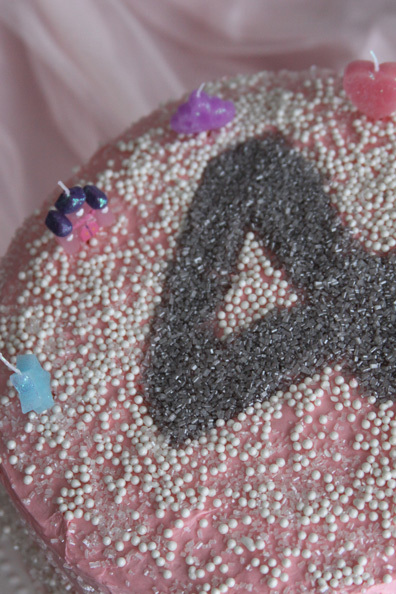 I also choose a font that was bold and not too complicated – the straighter less complicated fonts will be easier to read after the sprinkles are added. I started with a fully frosted pink cake and immediately began decorating with sprinkles. If you let the frosted cake sit too long before adding the sprinkles, they will not stick to the frosting very well! I then carefully placed the cut out paper four onto the center of the cake. 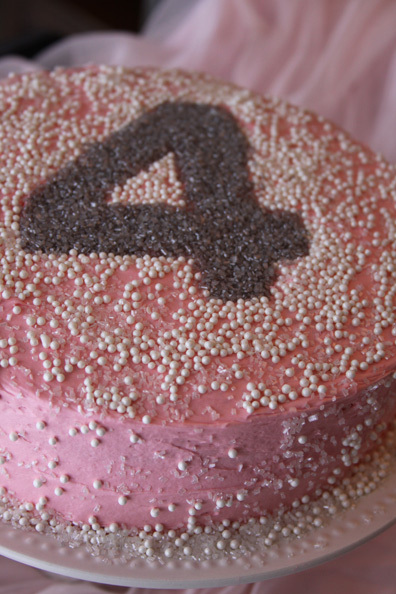 I sprinkled white pearl cake sprinkles all over the cake using the paper number as a stencil. I also added some crystal like sprinkles to make it a little more glittery for my little princess. I made sure that there were sprinkles completely outlining the paper number so that it would show up clearly once the stencil was removed. Next I used a toothpick to slowly remove the paper stencil. 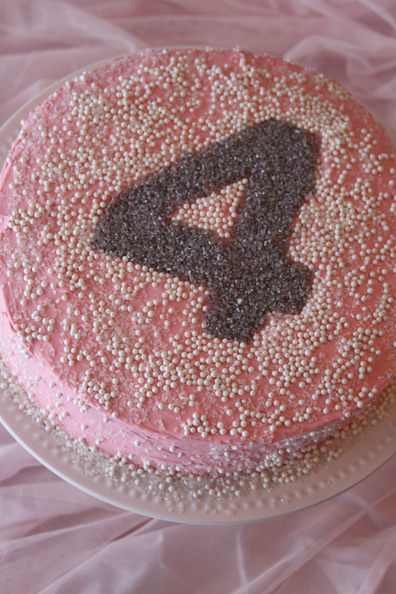 I peeled it off slowly and carefully and then used a small knife to smooth the frosting where there were no sprinkles (in the 4). Don’t be too worried about making this perfect because you are going to cover the space with more sprinkles. 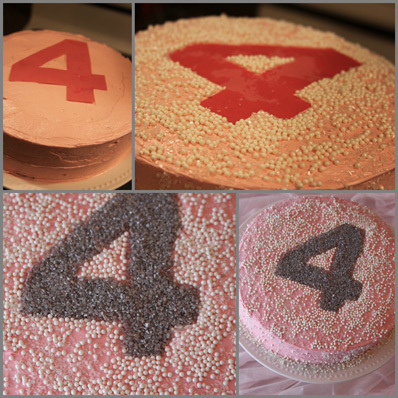 I then used some crystal like silver sprinkles to fill in the number 4 that was left after removing the “stencil”. Done! 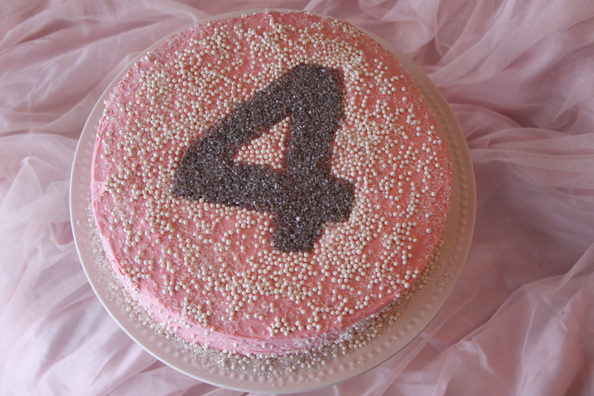 A simple way to turn a boxed cake mix into a fancy little cake adorned with the age of your little birthday princess! Way cheaper than a store bought cake too! My daughter was simply thrilled with her cake and I was happy to make it for her! It was so easy, but turned out so adorable. I will definitely be using this trick again!